László Bíró (BEE-roh or sometimes BYE-row) invented the now-ubiquitous ballpoint pen. Previously, writers used either pens dipped in inkwells or fountain pens, with interior ink reservoirs, but either method often led to splotchy documents and stained fingers. Bíró was always a tinkerer, and in addition to his pen he held patents for a steam-powered washing machine and an automatic transmission for cars, but he was working as a reporter when he noticed that ink from inkwells smudged easily and took several minutes to dry, while ink used to print newspapers dried much quicker. He tried using press ink in his fountain pen, but it was too viscous and would not flow properly. With help from his brother, a chemist, the ink was altered, and Bíró added a tiny rolling ball in a socket at the pen's tip. The action of rolling the ball across paper draws ink and regulates its flow, making spills and splotches a rare occurrence. Jewish, he fled his homeland to escape growing anti-Semitism, and patented his invention in Paris in 1938. He then settled in Argentina, where he opened Biro Pens of Argentina in 1940 to manufacture the pens. For several years, ballpoint pens were luxury items, selling for $12.50 each in department stores, but problems with both the ink and manufacturing processes kept the company struggling. 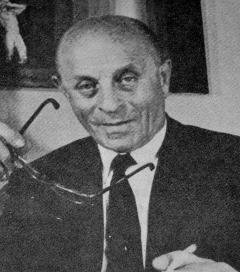 In 1945 Bíró sold his patent rights to a Frenchman, Marcel Bich (pronounced Bic), whose Bic pens made both Bich and Bíró millionaires, thanks to low-priced pens that "write first time, every time." Bíró was a high school classmate of Dennis Gabor. In many English-speaking nations, ballpoint pens are still commonly called "biros." Many sources incorrectly list his death date as 24 November 1985. But see his obituary, "Ladislao Biro: Invented Ballpoint Pen", Reuters, via The Toronto Sun, 26 October 1985, "who died Thursday", which would be the 24th of October.